Tears rolled down my cheeks as I walked down the once familiar path to a small cottage located in a corner of Neopia Central. The trail was worn and I could feel my shoes sink into the dips made as I had walked down and up, down and up, down and up again. I could clearly remember the day when I walked down and never walked back. Why did I have to suddenly leave one day without a goodbye? Why did I have to leave them alone and afraid? Why did I tread this path one last time with no intention of ever going back? The area around the house looked horribly unkempt. The tall weeds replaced the grass, the bushes were overgrown and untrimmed, the gardens were dry and lifeless, the trees’ ripe fruit was bug-infested and unpicked. The house looked even worse. The gutters were overflowing, the windows were grimy, the paint was chipping, the door was moldy and punched through in places. Regret and sorrow filled me once more. I approached the door and knocked once, twice, three times. No sound came from inside. Have they left? Have they placed themselves in the pound? Has someone taken them? Panic filled me. But then a clicking sound came from the doorknob. It slowly swung open to reveal the motiveless face of a Blue Kougra. At the sight of me, confusion filled the wrinkles engraved on the face from many years of depression. “Who are you?” droned the monotonous voice. Hot tears filled my eyes once again. The Kougra looked uncomfortable. He never was good with tears. “Um... Would you like to come inside?” he suggested tonelessly. Yes, I would like to come inside, come and hug the three creatures living in that neglected house, fix it up, cook them gourmet food, take them to the Rainbow Fountain; I would like to enter that house and never go back. But I simply nodded, sending salty tears everywhere. He stepped aside to reveal a room. It did not look like the outside. Tt was not clean, but not dirty either. It looked as though no one lived there; dust layered the fireplace and the bookshelves that lined the walls. The couch and curtains were faded. The potted plants were dead. 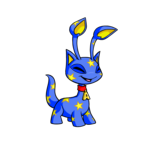 In the middle of the room, two neopets, a Blue Kacheek and a Blue Eyrie, were lying against a dusty pillow watching the static-y neovision on the north wall. They slowly turned their heads in unison to where I stood. They could have been painted grey. Their fur was matted, their eyes listless, their mood dispirited. Fat tears fell like a river onto the dull red carpet below. What had I accomplished in leaving? What did I think it would do? The Eyrie’s face echoed the Kougra’s confusion, but the Kacheek, the smartest of the group I remembered, stared at me blankly. I saw her, almost unnoticeably, mouth Why. I Don’t Know, I mouthed back, the tears pouring harder. The Kougra stepped away uncomfortably. “Um... why are you here?” I looked at him, so ashamed that he didn’t recognize me. “Jbluejsi,” I pleaded. He jumped, startled, at the sound of his full name, and some of the life came back to his face. “How do you know my name? !” he demanded. He doesn’t know me, He doesn’t realize that I came back, that I am regretful, and he doesn’t realize how much pain he has caused me. I turned to the Kacheek and stared, asking for help. “Blue.” The Kacheek’s dry, cracked voice echoed through the room. The Kougra whirled around. “It’s... her.” The Eyrie’s eyes widened. The Kougra slowly turned around and stared deep into my soul. “It is you.” His voice was small, almost like he was a little kid again. All eyes stared, disbelievingly, into mine for a moment. That moment passed on for what seemed like hours. I expected some one to move, someone to run up and embrace me, someone to speak up, but silence remained. It stretched on and on. I stared into the eyes of my loved ones, wondering why I did not return sooner. But something was wrong. The atmosphere was unchanged. There was no happiness in their eyes. I broke the spell by listing their names. “Jbluejsi. Blue. Milavelinea. Mila. Likadiamond4. Lika.” The tears were pounding against the ground now. “You don’t want me.” They were surprised at my successful guess. I had grown more than they thought. The moment, once again, stretched on. Then a voice spoke. “That’s not true.” Blue stepped towards me. “I want you.” My tears could not go any faster or harder. I ran forward and hugged him with all my might. He let out a squeal. They must be weak. I released him. “Sorry,” I apologized. “S’okay,” he said breathlessly. I smiled at him. Then a small voice sounded from behind me. “I want you.” I looked. Lika had stood up, witch must have been hard for her, considering her frail state. “I want you.” Milavelinea had stood up too, wincing as she did. Her leg appeared to be heavily bandaged. “Mila... Lika... Blue...” I thought it wasn’t possible, but the tears became a waterfall. I staggered forward, then bent down in front of the Blue Eyrie. I leaned and reached for her leg. She hissed instinctively and pulled it back. “It’s okay, it’s okay...” I coaxed as she lowered it into my hand. I unwrapped the bandages. The area underneath was swollen and bent at a strange position. Mila got up, keeping her damaged leg off the ground, and joined us. Blue padded over, tears silently streaming down his face, which was a extremely rare thing, and completed the little ring around my thighs. I bent down and hugged them all softly. I was home, home in the place that had been exactly that ever since I was little, home in the place where my loved ones grew up, home where so many memories had formed, home in the place that was meant to be, and I stayed. Over time the neopets got their energy back, and I was surprised at how quickly they did; Mila recovered and was soon zooming around town again, Flying with other winged pets and petpets, she made many new friends, one of which was a small green Pteri named Fadella, who would bring food and drinks over to our house when she slept over or when we were throwing a party. Blue got back into his old hobby, which is exploring the woods. Sometimes he would bring me back a discarded mystery capsule or a little key ring, and sometimes even a couple of fish from the stream. Lika got readdicted to reading and read out on one of the now dust free chairs that she had pulled outside under the non-infected plum tree, on the fresh green grass, across from the blooming rose and pansy garden, next to the nice little cottage, all located in a small corner of Neopia Central. Yay! first time! This is a real story about my old main, left for years. Came back and stayed, and liking it!